A newly built statue of great freedom fighter Netaji Subhash Chandra Bose was found partly vandalised and smeared with coal tar in West Bengals Birbhum district on Tuesday by unknown miscreants. Video: Youths cleaning the statue later after the incident. 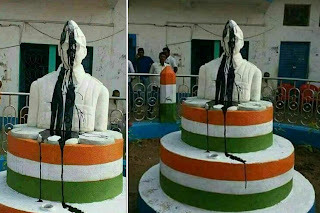 The statue was supposed to be unveiled on the Independence Day. The Netaji statue was to be installed in the Panchra village panchayat office compound. Police confirmed that the statue was smeared with coal tar and face was partly damaged.